Somehow, during his early fifties, Blant Hurt, a lifelong flatlander and lover of big cities, was transformed into an unlikely (yet avid) Ozarker. 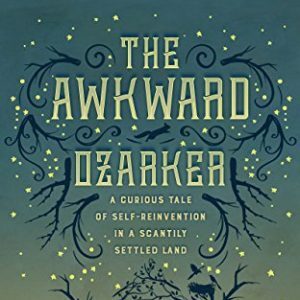 His journey is chronicled in The Awkward Ozarker: A Curious Tale of Self-Reinvention in a Scantily Settled Land… Visit the place where it all started – his so-called decent, little ole cabin up on Highway 9 (a place he and his wife now call Hogback Mountain). From here, a new world opens to his ‘true Ozarker’ neighbors down at the hamlet of Twin Creek, his prized cave and waterfalls, his wife’s mountain-top garden (and her preparations for the-end-of-the-world-as-we-know-it). You can meet Bear, his ‘sacred dog,’ see life-sized illustrations from the book, as well as hear an audio recording of a chapter or two. As a bonus, in counterpoint to the epic self-reliance of real Ozarkers, the author may even demonstrate his epic un-handiness when dealing with tools such as chainsaws and machinery like four-wheelers. What uniquely local and colorful fun!